Origin: Northern Amazon and tributaries. Company: Any other Semi-Aggressive to Aggressive South American Cichlid of similar size. Small bottom feeders that keep to them selves are also suitable tankmates. Aquarium Setup: A larger aquarium is a must for a breeding pair. 55 is recommended, but a 75 is much better. Include large hiding spots, plenty of securely rooted fake/real plants, and a large, unobstructed swimming space. Feeding: Severums should be fed a high-quality pellet food, with meaty treats (blood worms, tubifex worms, or krill) given once a week. 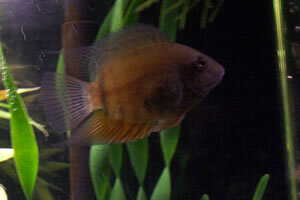 Breeding: Severum mates should be chosen similar to the method in which angels pair off. Buy six juveniles, and wait until they pair off. Choose one pair, and return/sell off the remaining. The “courtship” behavior consists of side rubbing, lip locking, and mock fighting. The female Severum will deposit the eggs on a horizontal surface, usually a slate or round rock (if one isn’t present, one should be added to keep them from laying clutches on larger, harder to remove items). To stimulate breeding, the temperature should gradually be raised up to the mid eighties. When the temperature is achieved, large water changes should be done every day until spawn occurs. Picture of Green Severum - Heros Severus.